What are the misspellings for chance? 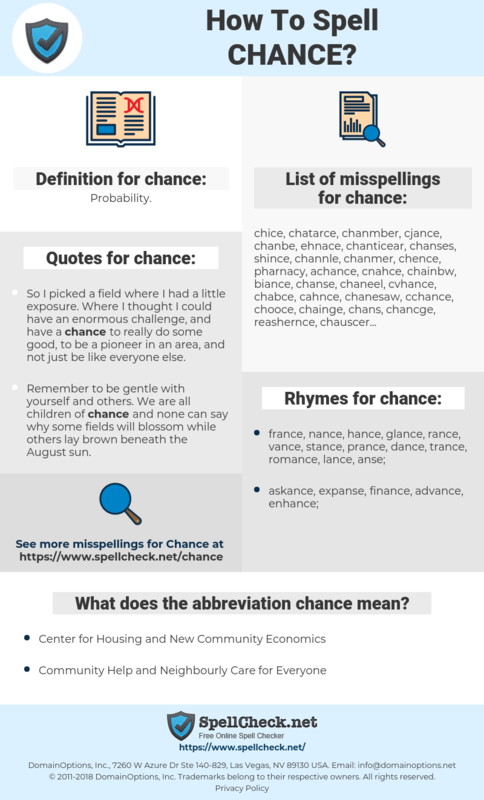 What are the common mistypes for chance? What is the definition of chance? What does the abbreviation chance mean? What are the quotes for chance? What are the rhymes for chance? What are the translations for chance? 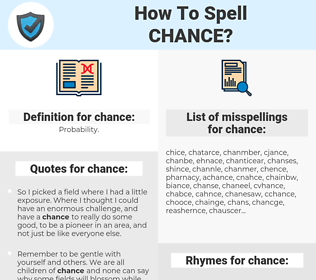 What are the common typos for chance? Chance as a boy's name is pronounced chans. It is of Middle English origin, and the meaning of Chance is "good fortune". Surname. Also variant of Chauncey (CHAWN-see) from the French "chancellor". This graph shows how "chance" have occurred between 1800 and 2008 in a corpus of English books. gelegenheid, mogelijkheid, geluk, kans, toevallig. occasion, possibilité, risque, hasard, espoir. Gelegenheit, Chance, wagen, Sorte, Aussicht, Risiko, riskieren, Wagnis, Glück, Zufall, Wahrscheinlichkeit, Fügung, ein Wagnis eingehen, ein Risiko eingehen, zufällig geschehen, Fortuna. チャンス, 機縁, きかっけ, ひょうし, 切っ掛け, みこみ, まぐれ. risco, coincidência, probabilidade, oportunidade, acaso, casual, possibilidade, casualidade. шанс, рискнуть, пойти на риск, решиться на. ocasional, caso, oportunidad, riesgo, posibilidad, casualidad, suerte, azar, probabilidad, fortuito, ventura.